With long slender straight double-edged blade, the edges running parallel up to the short point, struck with four circular marks each with a raised dot in the centre, a small cross issuant from one, and the tang with three transverse rivets for securing the grip and the hilt mounts. The hilt with bronze pommel formed as a lobated cap drawn down at the front and back to form a pair of shaped straps, the front slotted for a small ring mount, robust short cross-guard also of bronze, farmed with bold globular terminals, the middle widening front and rear to accommodate a low relief rosette formed as five concentric decorative bands, with traces of a wooden grip together with a bronze collar seated over the upper contour of the guard, drawn up to a narrow neck or strap, and cut with a triangular design of three stylized interlaced leaves. 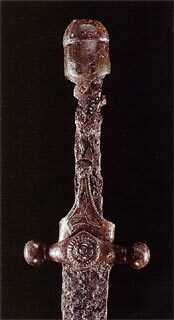 The scabbard mounts formed entirely of bronze, comprising a long chape retaining a portion of applied bronze relief ornament at the mouth, a pair of bands each with a rosette en suite with the cross-guard, a small ring and lappet, and a pair of U-shaped mounts from a sword-belt, each cast with beading and multi-lobe finials. This rarely seen type of sword belongs to a recognizable East European genus but one whose post-Roman origins are obscured by both a lack of contemporary cultural record and sufficient current archaeological evidence. This is in clear contrast to the wealth of information available to students of the Viking, Halstadt and La Tene cultures, for which an abundance of finds has provided the fabric for broad studies. In outline the majority of these early cross-hilted swords fall into the proto-saber type rather than the straight-bladed thrusting type seen here. Where they have survived, the hilts share sophisticated design principles and incorporate decorative elements strongly suggestive of the Islamic cultural sphere and its later East European off-shoots. A very small group of comparative examples is preserved in the Hermitage, St. Petersburg. This comprises fragments of swords and two sabers dating from the 9th to 13th century, found in Patzinak burial mounds (kurgans) in the Ukraine and north-west Russia. Further small finds are in the State Historical Museum, Moscow, one of which is hiked in a near identical manner to our example. Interestingly, it incorporates a small ring on the pommel and there is evidence of a similar ring on our hilt. In Hungary there is further comparative material at the National and Military Museums, Budapest, and the Museum of Balassa Balint, Esztergom. 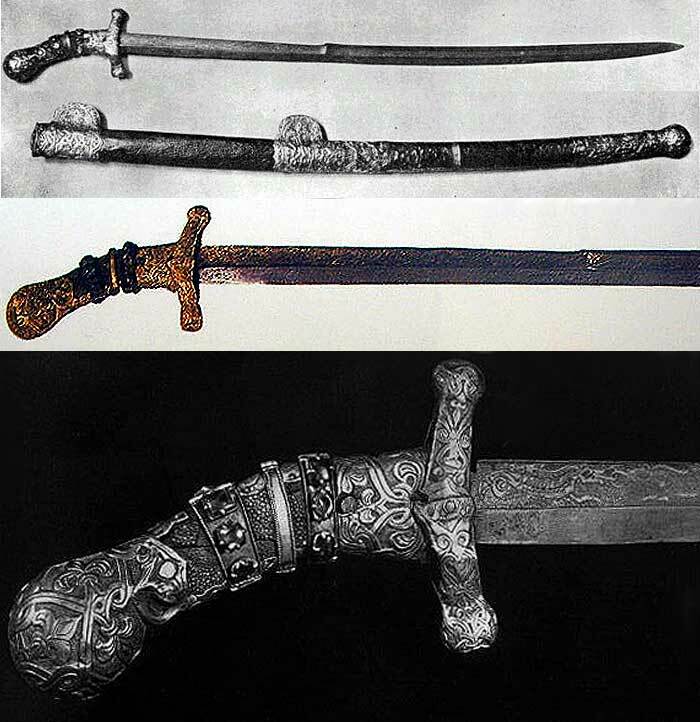 Certainly the most illustrious relative of our sword is the 9th century sword, said to have belonged to the Emperor Charlemagne, in the Imperial Treasury, Vienna. 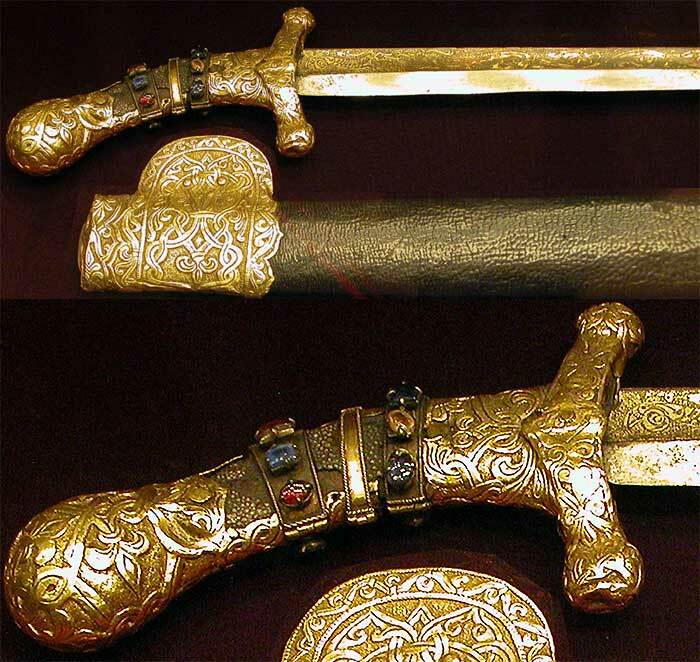 Various traditions accompany this gold-mounted sword: one states that it was presented by the Caliph of Bagdad, Harun al-Rashid; an impossible version credits it as the gift of Attila the Hun; and another, that it was given to a German prince by the widow of King Andras of Hungary, circa 1063. This serves to demonstrate the challenges remaining in the study of this dark but formative period of history. Literature: Nicolle, B.C.Arms & Armour of the Crusading Era, 1050-1350] : Western Europe and the Crusader States, London, 1999, figs. 794-796. Islamic Arms and Armour, London, 1979, pp.184-185, fig.41. That is really cool... And something I previously knew nothing about. Thank you for posting that. I keep running into examples of proto-sabres online lately. This is fantastic and I'd love to hear from someone who has handled a sword of this type. Yet another example I'd love to see Albion start making - or maybe one to get custom made eventually. Vince Evans probably has experience in this area. Thanks Kirk. 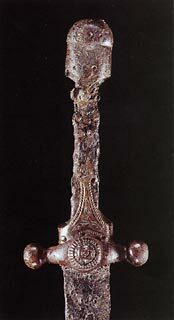 That is the first oppertunity I have had to see the blade of the Charlemagne sabre. It kind of looks like there are two transverse ridges dividing the fuller into three. Is this the case? It kind of looks like there are two transverse ridges dividing the fuller into three. Is this the case?